I had the chance this week to speak with Carey Lovelace and Sharon Kanach, the co-curators behind a new exhibition of composer Iannis Xenakis’s sketches, drawings, scores and plans spanning from 1953 -1984 titled “Iannis Xenakis: Composer, Architect, Visionary.” The show opens at the Drawing Center on Friday, January 15th and it will run through April 8th. To coincide with the exhibition, a number of arts organizations in New York City organized public programs on Xenakis’s work in collaboration with the Drawing Center, including a virtual reality rendering of Poème Électronique, a three-day colloquium bringing together Xenakis scholars from the Americas, and much more. Please check the full schedule here (scroll to the bottom). Based in Paris, Sharon Kanach worked very closely Xenakis for two decades, as a translator of his works, as a scholar and as Vice-President of Centre Iannis Xenakis (formerly CCMIX) in France. Carey Lovelace is an independent curator and writer based in New York. Both are former students of Xenakis. I’m wondering how you, Carey and Sharon, began working on this exhibition and pulling together materials for the show. Sharon: What was revelatory for me, when going through the documents, sitting at a reading table at the Bibliothèque with Carey was realizing, what I dare say, a painterly approach he had to the blank page. Even if he’s writing an article, the placement of his text and everything is extremely important. His use of color, his use of the line, I saw it as part of his creative process. Then you abstract it from the work it is related to, and it’s a gorgeous piece of art. I don’t think he did it intentionally like that, it was almost a déformation professionnelle - of just dealing with the blank page as a canvas. I actually wanted to ask you about Xenakis and painting. 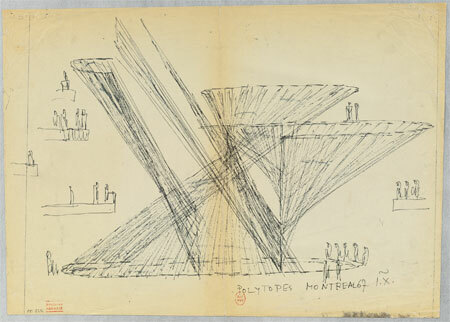 In the chapter on Polytopes in the Nouritza Matossian biography of Xenakis, she quotes him as saying “Cinema is limited to a flat screen which is a little window” and in his polytope structures, she says that he attempted to achieve “cinematographic painting” which would go beyond this little window, creating a fully immersive light and sound environment. 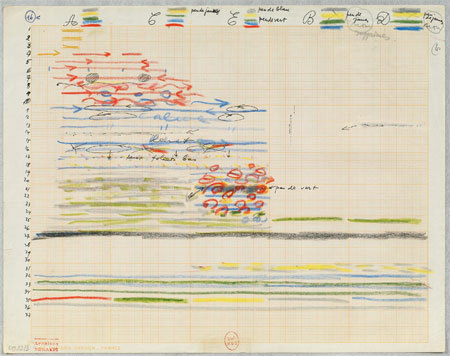 How well versed was Xenakis in painting - and how do you think painting influenced his work? Sharon: I think there’s one very important thing to point out in the quote from Matossian. I think there’s a mistranslation - I think they’re talking about kinetic, not cinematographic [painting]. Sharon: I think for him, painting was something separate. I think he was interested in painting, his wife certainly collects painting until this day, their daughter is a painter and sculptor, he’s sensitive to it. When I say his approach was painterly, it was in terms of really a visual artist, not as a painter who paints, etc. Carey: Almost more profound than that, to me what is so riveting about him is his process. Like a lot of people will take what the culture gives you, and they’ll go through that, and that’s how they form what they think. It’s like he went to the foundation of the arts, like the physical basis in physics. That’s partly why he was involved with technology at such a formative level, and so many different media. He saw things as almost an engineer would in terms of their structural relationship to one another. He conceptualized that, which translates into technology, but it can also translate into music, it can also translate into graphics and all sorts of things. Sharon: I think the keyword also is abstraction. This is what he preached - morning, noon, and night. Getting away from figuration, from narration, for him, going deeper and deeper into the fundaments of making music or making architecture or making whatever. The more and more abstract you are, the more original you can be. This was always his quest - of trying to take the very basic materials and doing something original with them. This relates to something else I wanted to talk about, which is Xenakis’s approach to the overall form of the composition. Sharon, in your essay in the catalog you discuss how drawing allowed Xenakis to visualize the whole of the musical composition - a move that was distinct in that most composers were trained to think of the small, micro structures that eventually formulate the whole, instead of beginning with the entirety in mind. 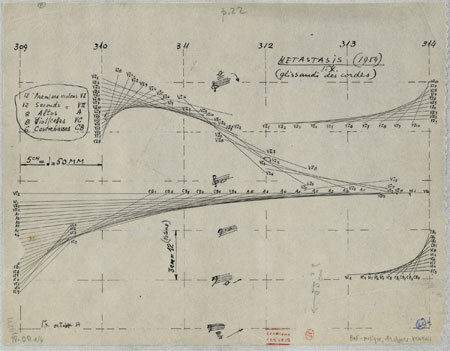 How do you think this method influenced the precision with which Xenakis directed individual performers? It seemed like he didn’t allow a lot of space for interpretation, in order to achieve this overarching structure. The other subject I wanted to talk to you about was Xenakis’ invention of the UPIC - a computerized compositional device created in 1977 that allows the user to draw waveforms on a tablet which would translate to sound in real time. Sharon, you discuss the UPIC in the latter part of your essay in the catalog. How did Xenakis implement the UPIC? Was it meant to be a machine that would encompass both orchestra and composer in one contained unit? Or do you think the UPIC was meant to be simply an instrument - one element in a larger ensemble? Sharon: In Formalized Music, I believe, there is an appendix on the UPIC which kind of explains why he created it. […] I’m not an electronic music expert, but he completely reverses the way electronic music was conceived at the time. In my own personal experience with it, with the first generation UPIC in the late 1970s, it was extremely frustrating. I wanted it to do what you were saying, I wanted to go in there with an oscillograph of a clarinet, copy it into the machine, and have the machine play back a clarinet. It wouldn’t do it. It had a mind of its own, a mind that was a very Xenakian mind. […] It was a research center, the CEMAMu [Centre d’Etudes Mathématiques et Automatique Musicales], which developed the UPIC. It was a very expensive machine, it was like $50,000. There was only one machine, and it started becoming very popular as a pedagogic tool. You didn’t have to know how to read music in order to make music. So we did a lot of workshops with kids, with blind people, with people who were musically illiterate, the machine traveled to Japan. It was a hot item. And Iannis was like, what am I going to work on? Because it was always traveling. Then in 1985 the Atelier UPIC was created, which received a grant to create one or two other machines. Those would be what would travel, and the CEMAMu would keep its machine, and keep doing research and refining the software.